TORONTO, Mar. 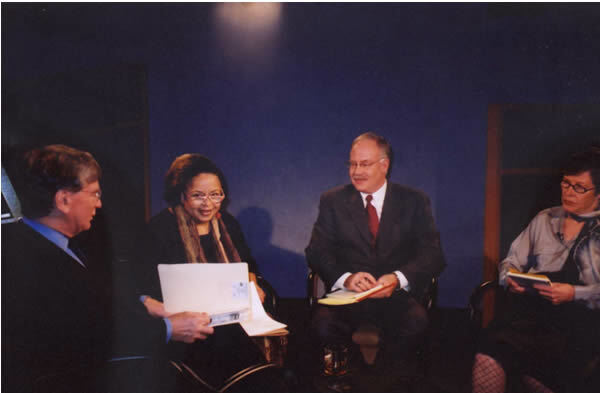 10, 2002 [corrected viewer information March 17, 2002] - Michael C. Ruppert, editor and publisher of FTW, raised more than a few eyebrows, during a televised debate, when he presented a scathing indictment of US government complicity in the attacks of September 11. The program, produced by Vision TV, is estimated to reach 8.5 million Canadian and DTH households. Vision TV is not available in America. Vision TV Insight presents the special one-hour long edition of Mediafile, entitled "9/11 Roundtable," that will air on Thurs., Mar. 14, at 9 p.m. and 11 p.m. ET on the Vision TV network. Six months after the attacks of September 11, the official explanation of events has been left largely unchallenged by mainstream North American media. The producers of Vision TV Insight have taken bold steps aimed at challenging the status quo, reminding us that the media does have a duty to inform and challenge its audience. The programme "9/11 Roundtable," follows on the heels of Vision TVпїЅs Mediafile host, Barrie ZwickerпїЅs controversial six-part commentary which boldly examined the official narrative of the events of September 11 and found it to be "frankly implausible." ZwickerпїЅs series touched a nerve. The positive response it received indicates that there is a growing audience that does indeed want answers to the questions exposed by the official explanation of events of September 11 and its aftermath. The groundswell of opposition to the official narrative of 9/11 is reflected by RuppertпїЅs increasingly popular lecture series, bourgeoning FTW subscription lists and massive sales of his video, "The Truth and Lies about 9/11." Increasing numbers of people in all walks of life, are clearly eager for alternative analysis of the events of September 11 and unwilling to accept the official narrative any longer. "9/11 Roundtable," hosted by Vision TV Insight executive producer Rita Deverell, provides a forum for a long overdue yet refreshingly frank debate focusing on the question, "What really happened on September 11?" Ruppert faces an influential Canadian panel including Ron Atkey Q.C., former chairman of the Security Intelligence Review Committee, the agency responsible for CSIS (the Canadian intelligence community), journalist-educator Peter Desbarats, and ethicist Phyllis Creighton. RuppertпїЅs insightful analysis challenged the panel to tackle thorny issues such as the relationship between illicit drug trade, oil and U.S. foreign policy; the long history between the bin Laden and Bush families; questions raised by the actions and inaction of the U.S. government prior to, and on, September 11; and the lack of plausibility and logic in the U.S. governments official explanation of those events. Peter Desbarats was the Dean of Journalism at the University of Western Ontario from 1981-97. He sat on the Commission of Inquiry into the Deployment of Canadian Forces to Somalia and was later appointed as the Maclean Hunter Chair of Communications Ethics at Ryerson University. Ron Atkey Q.C. was a former Conservative immigration minister in the government of Joe Clark. From 1984-89, he was the first chairman of he Security Intelligence Review Committee, the agency responsible for CSIS (the Canadian secret service). Phyllis Creighton serves on the Health Canada board on reproductive technologies. She is a council member of the International Peace Bureau, the oldest peace organization in the world. She was a member of the group that produced "Just War? Just Peace! ", an educational resource for the Anglican and Lutheran churches.